The most cost-effective airflow style, crossdraft booths offer reliable performance at an affordable price point. Since there is no pit to dig, crossdraft booths are also easier to integrate into existing facilities. 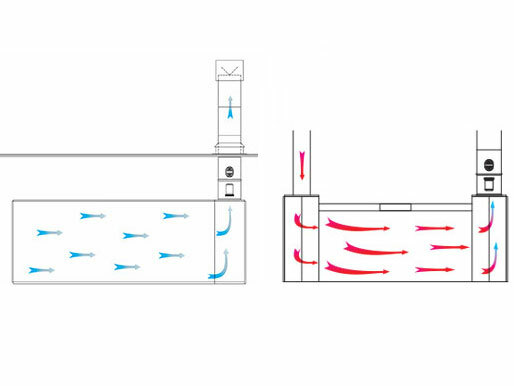 Air flows horizontally through a crossdraft booth, starting at the front of the booth and flowing over the product or part and into a filter bank in the booth rear. GFS’ Large Equipment Paint Booths are designed for long-lasting performance and constructed of high-quality materials for unrivaled structural integrity. Our smallest paint booths, Bench Booths allow businesses and hobbyists to paint small products in a safe, code-compliant environment. With high-efficiency filtered intake doors, GFS Enclosed Finishing Booths provide a safe, cost-effective finishing environment for producing quality paint finishes. General Purpose Paint Booths are high-quality, cost-effective solutions for industrial manufacturers and businesses that need to paint medium-sized equipment, utility vehicles and trucks. Our most popular and affordable product line, Open Face Paint Booths provide a bright, safe and clean environment for your finishing operations. The Performer® ES automotive spray booth was designed and built with the value-minded shop owner in mind. want to learn more about crossdraft paint booths? Starting at $15,275, the Performer ES Paint Booth is Global Finishing Solutions’ most affordable automotive paint booth. The perfect solution for small-to medium-sized shops looking for an all-in-one paint environment, the Performer ES is also ideal for industrial shops and businesses painting small equipment or parts. Although available at a lower price point, this popular booth features the quality and reliability that you’ve come to expect from GFS.